Did you know citrus paired well with carbs? Now you do. Try this Lemon Butter Garlic Sauce on top of your favourite pasta and get ready to be a lemon-based sauce convert. 3 ounces (about 3 cups) baby arugula leaves or spinach. Directions: Bring a large pot of salted water to a boil. Cook pasta according to package instructions. Drain cooked pasta. In the same large pot over medium heat, melt the butter and cook an additional 1 to 2 minutes. If you want browned butter, cook until it has a light brown color. Add the garlic and stir, and cook until fragrant, about 1 minute. Be careful not to over-brown the butter or garlic. Remove the pot from the heat. Add the olive oil, lemon juice, lemon zest, and salt. Stir to combine. Add the pasta, arugula or spinach and pine nuts and toss to coat with the sauce. The arugula or spinach will wilt. Transfer pasta to a serving bowl, platter, or individual plates. 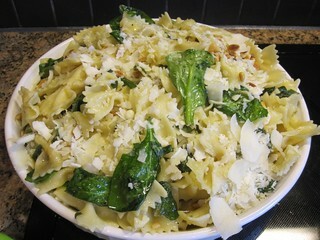 Top with shaved parmesan cheese. Serve immediately.